Welcome. We are responsible and reputable Dalmatian show exibitors and hobby breeders of top quality Show Dalmatians & Dalmatian puppies, located on a quaint farmstead just outside of Lindsborg, Kansas. We have owned Dalmatians for 28 years and have been participating in the wonderful sport of AKC dog shows for over 24 years. I am an AKC Breeder of Merit. 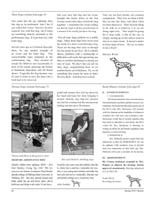 We hope you enjoy your visit and find helpful information about the beautiful and intelligent breed of Dalmatians. JLS Dalmatians is dedicated to promoting & protecting the health, temperament, soundness, and overall integrity of this wonderful breed, the Dalmatian. Our Dalamatian dogs and puppies compete in Conformation, Obedience, Agility, Rally, Road Dog, Fly Ball and serve as Therapy Dogs, READ (Reading Education Assistance Dogs), Public Education canine ambassadors, one is a Service Dog, one is a Seizure Assistance Dog and one is a Guide Dog! #1 Show Dalmatian in the US in 2002 (campaigned 7 months!) all breeder/owner handled by Julia Soukup with no advertising! #4 Dalmatian in 2003 in selective showing only. #7 Dalmatian in 2004 in very limited showing. Five consecutive years in the Top 20! DCA 2004 Best Stud Dog & AOM under breeder judges! Also a top producing Dalmatian Register of Merit sire! Unretouched Head study photo above by Gilda Turner. Click here to see Newt's Kids! "Newt", MBISS Ch JLS Just A Fig Newton ROM (L) had a grand time showing in 10 & Over Veteran class at the 2012 DCA National Specialty show! Love my boy! The latest show ring wins, brags or announcements regarding JLS bred puppies, owned or sired Show Dalmatians. We have a 11 month old B&W Male Puppy available to a companion home and a 17 month old L&W Male Teenager available to a Performance Home. He would be FUN! Ch JLS Milliflora Petunia (L), "Petunia", (Barr/Turner/Soukup) took 2 more BOB's, 4 OHBOB's & 2 Owner Handler Group 4's, and 4 more Select wins towards her Grand Championship. And she has a new FastCAT title. She LOVES Lure Coursing! This was in 2 weekends at the Columbia, AL and Perry, GA shows in stiff competition. WTG Gilda Turner and congrats to Mommy Mavis Barr! Click here to see our litter plans. "Caesar", JLS Caesar Augustus Schumacher (L), is a Church & School mascot for the Church of St Joseph, loved by Father Patrick Schumacher. "James Brown" CH JLS I Feel Good CD RN, CGC, Delta Therapy dog, READ (Reading Education Assistance Dog) and his owner/trainer Shirley May visit schools and libraries as part of a Reading program for children. 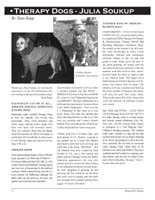 Reading Education Assitance Dog & Therapy Dog article. "D'Leo", UAG2 ASCA CD JLS Roaring To Go CD RE TDI (L) is a Tail Wagging Tutor at the Nicoma Park Library! Children like to read to their new spotted friend. "Jinx", JLS Dori Hartely's Crying Sky CGC, TDI (L) is now owned by Danielle and is her seizure response service dog. Jinx goes with Danielle to college and helps her when she has a seizure. "Caden", JLS Leading The Cavalcade is owned by Lindsay Neil and Julia Soukup and is Lindsay's service dog. Unfortunately, Caden was retired as a Service Dog due to a acquired health issue, but that in no way diminishes his willingness and capabilities. 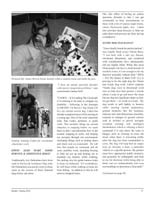 See Therapy Dog/Service Dog Article featuring JLS Dalmatians in The Spotter Spring 2010 Issue (page 72). Click here for online issue! Or read the article as PDF pages here! Copyright © 1999 ~ 2019 JLS Dalmatians, Julia Soukup, & JLS Canine Services Web Design.